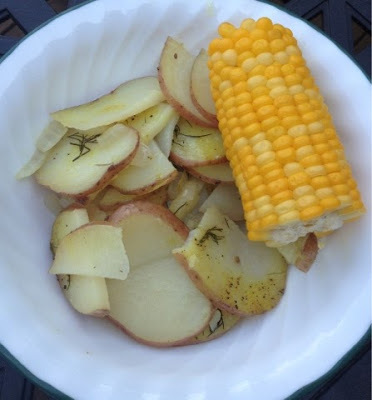 Packet potatoes are one of our camping/cookout favorites! They are so easy to make. You can even prep them ahead of time to take with you on your camping trip so all you have to do is throw them on the fire. Here's the original recipe, but of course we make way more than this to feed our crew. Preheat oven to 450º (if baking). Spray foil with cooking spray or lightly brush with oil to prevent sticking. Center onion on foil. Layer potatoes evenly on top of onion. Drizzle with oil. Sprinkle with seasonings. Bring up sides of foil and double fold. Double fold ends of another piece of foil to form one large foil packet leaving room for heat to circulate inside of packet. Bake 30-35 minutes on a baking sheet or 15-20 minutes on a covered grill. You can also place over a campfire for about 20-30 minutes. Serve it up with your other favorite foods and enjoy!